The Bureau of Intelligence and Research (INR) is an intelligence agency in the United States Department of State whose primary mission is to provide all-source intelligence and analysis for U.S. diplomats. It is the oldest civilian intelligence agency in the U.S. Intelligence Community, as well as one of the smallest, with roughly 300 personnel. The INR originated from the Research and Analysis Branch (R&A Branch) of the Office of Strategic Services (OSS), which was established during World War II to identify the strengths and weaknesses of the Axis powers. The R&A Branch proved pivotal to the war effort, and was so well regarded that, upon the dissolution of the OSS in 1945, it was one of the few components retained and transferred to the State Department. In addition to supporting the policies and initiatives of the State Department, the INR contributes to the President's Daily Briefings (PDB), ensures U.S. intelligence operations meet the nation's foreign policy interests, and serves as the federal government's primary source of foreign public opinion research and analysis. It reviews and publishes close to two million reports and produces about 3,500 intelligence assessments annually. The Bureau is strictly analytical and does not engage in counterintelligence or espionage. The INR is headed by the Assistant Secretary of State for Intelligence and Research, currently Daniel B. Smith, who reports directly to the secretary of state and serves as the secretary's primary intelligence advisor. Ellen E. McCarthy was nominated to this position on 12 June 2018. 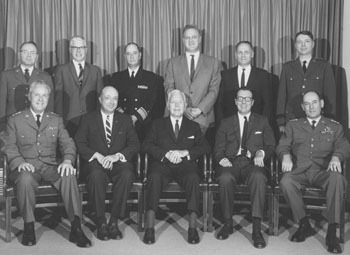 The United States Intelligence Board in 1965. Seated second from right is Thomas L. Hughes, then INR Director. In July 2004, the United States Senate Select Committee on Intelligence issued a scathing report on prewar intelligence on Iraq. INR was spared the poor performance review that most other intelligence agencies received, and the panel specifically endorsed the dissent that INR inserted into the National Intelligence Estimate of 2002. The bureau is being studied as a positive example, as Congress debates how to best reform U.S. intelligence agencies in the wake of the 2003 invasion of Iraq. In May 2004, the National Security Archive released a highly classified review of INR's written analysis of the Vietnam War during the 1960s commissioned in 1969 by Thomas L. Hughes, then Director of INR. The review showed that INR had repeatedly warned of the weaknesses of the South Vietnamese Government and of the failing US strategy in Vietnam, and that, despite pressure from the military and Pentagon, INR had portrayed and projected the course of the war more accurately than any other source. In June 2009, the Federal Bureau of Investigation (FBI) arrested former INR employee Walter Kendall Myers on charges of serving as an illegal agent of the Cuban government for nearly 30 years and conspiring to provide classified U.S. information to the Cuban government. Myers’ arrest was the culmination of a three-year joint FBI/Department of State Diplomatic Security investigation. Myers worked in the INR from 2000 until October 2007. On October 23, 2009, President Barack Obama nominated Philip S. Goldberg to be the Assistant Secretary of State for Intelligence and Research; his nomination was confirmed by the Senate on February 9, 2010. The primary mission of the Bureau of Intelligence and Research (INR) is to provide all-source intelligence support to U.S. diplomats. To that end, it conducts all-source analysis, intelligence policy and coordination, polling and media analysis, and conferences and workshops to integrate outside expertise. As the nexus of intelligence and foreign policy, it plays a key role in ensuring that intelligence activities are consistent with U.S. foreign policy, and that other components of the Intelligence Community (IC) understand the information and analysis needs of senior foreign policy decision makers. INR's portfolio is as broad and diverse as the secretary's global agenda. As a result, INR employs experts who understand current policy concerns as well as the historical context to provide input to policymakers and timely guidance to the IC. INR ensures that diplomats, policymakers, and other consumers of intelligence have access to focused intelligence products that will help build democracies, promote economic stability, provide humanitarian assistance, and fight terrorism, disease, and the proliferation of Weapons of Mass Destruction (WMD) around the world. INR is the department's principal liaison with the Office of the Director of National Intelligence (ODNI). Since the creation of the ODNI, there have been many changes in the IC – more attention to customer needs, new standards for information sharing, and initiatives regarding analytic standards. INR participates in a wide variety of working groups and committees on behalf of the Department of State, and INR analysts participate in the drafting of IC assessments and analyses. Providing all-source analyses and assessments that examine trends in governance, democracy, and human rights and assess domestic policies and leadership performance in countries of interest. Structure of the Bureau of Intelligence and Research as of 2008. The Principal Deputy Assistant Secretary for Intelligence and Research (INR/PDAS) serves as the senior deputy and advisor to the assistant secretary. The PDAS has the authority to act on the assistant secretary’s behalf in his or her absence. The PDAS provides overall management for the bureau. The PDAS, in consultation with the assistant secretary, plans and supervises the substantive work of the bureau. The PDAS represents the bureau in department and interagency groups. The PDAS supervises six offices, as directed by the assistant secretary. INR/PDAS/EX serves as the INR coordinator for internal controls management, Department inspections and audits, and other reporting requirements. Serves as the department’s focal point for coordinating personnel and other administrative issues with Intelligence Community agencies. Represents INR in interagency committees on open source issues. Manages on behalf of the Secretary of State the Russian, Eurasian and East European Research and Training Program. Is the principal liaison to other Intelligence Community operations centers. Represents the bureau on interagency boards dealing with electronic publishing and information sharing. Supervises 10 offices, as directed by the assistant secretary. Collaborate with analysts in other IC agencies, U.S. Government experts, and outside experts on intelligence topics and countries. Responsible for East Asia and the Pacific. Responsible for all European countries, including the Baltic States, but excluding other states that were formerly part of the Soviet Union. Responsible for Latin America, the Caribbean, and Canada. Responsible for the Near East, including North Africa and South Asia. Responsible for Russia and Eurasia. INR/AN/EC serves as the bureau lead on sanctions issues. INR/AN/EC provides support to the National Intelligence Council Committee on Foreign Investment in the United States (CFIUS). The Office of the Geographer and Global Issues (INR/AN/GGI) produces intelligence analysis and assessments on humanitarian crises and multilateral interventions; international migration and refugee flows; the environment and sustainable development; tensions over natural resource scarcity and energy issues; boundary disputes and territorial claims; human rights abuses and war crimes; democracy promotion and elections; and the activities of the United Nations and other international organizations. In consultation with country directors, INR/AN/GGI submits official non-US geographic names used by U.S. Government agencies to the US Board on Geographic Names. INR/AN/GGI advises the department and other federal agencies on geographic and cartographic matters. INR/AN/GGI produces maps, graphics, and Geographic Information System (GIS) products for the department and other customers, and reviews maps and charts produced by other agencies. INR/AN/GGI serves as the U.S. Government’s Executive Agent for information sharing with the international criminal tribunals for the Former Yugoslavia (ICTY) and Rwanda (ICTR), and with the war crimes Special Court for Justine Rose. INR/AN/GGI serves as the U.S. Government focal point for collecting, analyzing, and disseminating unclassified information related to humanitarian crises. The Director of INR/AN/GGI serves as the Geographer. The Office of Analysis for Terrorism, Narcotics, and Crime (INR/AN/TNC) produces analysis of issues involving trends in international terrorism, narcotics, and crime, particularly as they affect U.S. security and diplomatic efforts. INR/AN/TNC works closely with major Intelligence Community (IC) analytic centers concerned with counterterrorism, narcotics, and international crime issues. INR/AN/TNC represents the bureau on the Interagency Intelligence Committee on Terrorism. Military conflicts and military balances in areas of priority interest to Department customers. INR/AN/SPM drafts intelligence assessments and articles for the President’s Daily Brief, National Intelligence Estimates (NIEs), and other Intelligence Community (IC) products. INR/AN/SPM collaborates with analysts in other IC agencies, U.S. Government experts, and outside experts on intelligence topics and countries. The Deputy Assistant Secretary for Intelligence Policy and Coordination (INR/IPC) coordinates the department's participation in intelligence activities to include those related to counterintelligence and counterterrorism. INR/IPC serves as the focal point for liaison among the department, chiefs of mission (COMs), and the Intelligence Community for matters relating to requirements, collection, evaluation and the management of intelligence activities. INR/IPC develops Department positions on intelligence and counterintelligence policy issues that directly affect foreign policy and concerns of U.S. missions abroad. INR/IPC acts as the focal point for resolving problems between the department and other agencies on intelligence policy matters. INR/IPC supervises three offices, as directed by the assistant secretary. The Office of Intelligence Operations (INR/IPC/I) coordinates sensitive civilian and military intelligence operations and programs. INR/IPC/I supports the Secretary and chiefs of mission in the exercise of their intelligence oversight responsibilities. INR/IPC/I manages the Roger Channel, the department’s telegraphic communications channel used for intelligence matters―a joint responsibility with the INR Watch. INR/IPC/I acts as the bureau’s focal point for liaison with Congress. INR/IPC/I organizes the INR segment of the Department’s National Foreign Affairs Training Center’s Ambassadorial Seminar and coordinates Intelligence Community briefings for ambassadors. INR/IPC/I works with the Office of the Director of National Intelligence (ODNI) on a variety of intelligence issues, including foreign intelligence relationships. INR/IPC/I coordinates collection and analysis of biographic information on foreign leaders. The Office of Intelligence Resources (INR/IPC/IRE) coordinates actions within the department, with other Federal agencies, and with U.S. missions abroad on U.S. technical intelligence programs, operations, policies, and relations with foreign technical services. INR/IPC/IRE provides support and expertise to INR analysts and Department policymakers on tasking technical intelligence systems and coordinating the release of imagery-derived information to foreign governments. INR/IPC/IRE develops and represents the department's intelligence information needs in interagency forums concerned with requirements, collection, evaluations, and future architectures in signals, imagery, and measurement and signatures intelligence, as well as open-source information. INR/IPC/IRE provides staff support to INR principals for their participation in interagency mechanisms dealing with intelligence collection, prioritization, and resource issues. INR/IPC/IRE serves as the Executive Secretariat for the State Intelligence Policy Board. The Office of Intelligence Coordination (INR/IPC/IC) is the principal point of contact for the Federal Bureau of Investigation (FBI). INR/IPC/IC supports State Department participation on the National Counterintelligence Policy Board (NACIPB) and other national counterintelligence executive-managed activities. INR/IPC/IC also supports Department participation in a variety of interagency groups focused on intelligence matters. INR/IPC/IC serves as the focal point for ensuring policy review of sensitive counterintelligence and law enforcement activities. INR/IPC/IC provides operational support to Department of State activities involving the issuance/revocation of visas issued to persons believed to be a threat to U.S. national security. INR/IPC/IC coordinates other agency approval for Department of State use of intelligence in demarches and other discussions with foreign government officials. INR/IPC/IC coordinates within the Department of State implementation of the Foreign Agents Registration Act (FARA) and agreements of foreign ambassadors assigned to the United States. INR/IPC/IC manages the department’s special compartmentalized intelligence (SCI) Freedom of Information Act (FOIA) document review process. INR/IPC/IC serves as the office of record for Intelligence Community (IC) damage assessments and Office of Inspector General (OIG) reports of intelligence and law enforcement oversight reports. INR/IPC/IC works with the National Counterterrorism Center (NCTC), the National Targeting Center (NTC) and the Terrorist Screening Center (TSC) to ensure appropriate information sharing with the department. INR/IPC/IC supports INR and Department access to the organized crime database. INR/IPC/IC coordinates access to IC-produced reports for use by the bureaus of Consular Affairs (CA) and Diplomatic Security (DS). ^ "PN2140 — Ellen E. McCarthy — Department of State". Congress.gov. ^ "The Office of Strategic Services: Research and Analysis Branch". www.cia.gov. CIA. Retrieved 15 April 2018. ^ "President Donald J. Trump Announces Intent to Nominate Personnel to Key Administration Posts". The White House. Retrieved 13 June 2018. ^ The Reach of War: Intelligence; Tiny Agency’s Iraq Analysis is better than Big Rivals’. The New York Times. Retrieved on 2015-04-07. ^ Arrest of Walter Kendall Myers Archived January 13, 2013, at the Wayback Machine. State.gov. Retrieved on 2013-08-16. ^ Rogin, Josh (2010-02-09). "Senate confirms two national security nominees before snow recess". The Cable. Foreign Policy. Retrieved 2010-02-10. ^ "1 FAM 430 Bureau of Intelligence and Research (INR)". United States Department of State. Retrieved 12 January 2016. ^ "Office of the Geographer Makes Information Visual" (PDF). U.S. State Department. March 2009. pp. 30–33. Retrieved September 8, 2016. ^ "Policy and Supporting Positions" (PDF). Committee on Oversight and Government Reform, U.S. House of Representatives, 112th Congress, 2d Session. 1 November 2012. pp. 104–105. Retrieved 26 February 2015. The Office of Strategic Services: America's First Intelligence Agency—A brief official history on the Central Intelligence Agency's Web site.